""The U.S. still has a chance to avoid a BSE [bovine spongiform encephalopathy] epidemic"" like the outbreak of ""mad cow disease"" that has ravaged the British cattle industry, warns this explosive report by Pulitzer Prize-winning writer Rhodes (The Making of the Atomic Bomb). In Britain, Rhodes notes, BSE spread after lax government regulations permitted millions of cattle to ingest ruminant wastes by way of meat-and-bone meal, and evidence mounts that Creutzfeldt-Jakob disease (CJD), a human variant of BSE, has already killed Europeans who ate infected beef. Both CJD and BSE belong to a strange new group of ""slow virus diseases"" (transmissable spongiform encephalopathies, or TSEs) that riddle the brain with holes, result in slow death and so far defy efforts to stop them. In cinematic fashion, Rhodes creates a complex, colorful and sometimes gory medical documentary, beginning with a 1950s-era cannibalism-induced epidemic of kuru (a fatal neurological disorder) in New Guinea, then jump-cutting to a San Francisco lab where, in 1983, biochemist Stanley Prusiner identified prions, or abnormal proteins, as the possible disease agent of TSEs, then moving on to a 1985 global outbreak of CJD in children with dwarfism who were injected with human growth hormone. 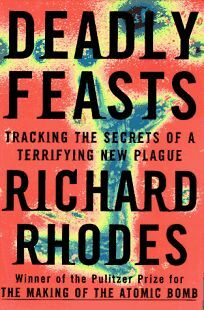 Rhodes's important, gripping book ominously warns that unless the FDA bans and strinctly enforces that ban the feeding of ruminant protein to cattle, Americans could face its own plague of fatal brain diseases. Photos. BOMC and QPB alternate selections; first serial to Washington Post Magazine; author tour. (Mar.) FYI: Publication of Deadly Feasts has been moved up three months in order to inform public comment regarding a proposed ban, announced by the FDA in January, on the feeding of processed ruminant animal wastes to cattle.